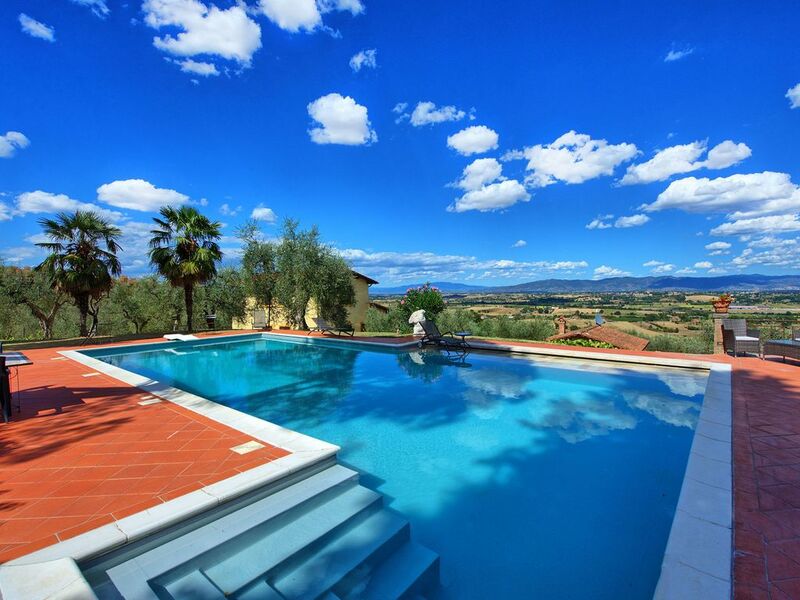 Apartment with swimming pool available to rent, located roughly 600m from the lovely Tuscan town of Lucignano, in the province of Arezzo. The apartment lies on the top floor of a country house, of which the ground floor is lived in by the owner - a kind and friendly person who shares in the use of the beautiful swimming pool. The owner is available when necessary and will give you suggestions and advice about what to see and do and where to eat the best traditional Tuscan meals. First floor: entrance into living area (TV) with fireplace and dining area, kitchen (oven, fridge-freezer, American coffee maker, microwave), double bedroom, single bedroom, bathroom with shower. There are two fans in the apartment. Location is fantastic! Beautiful view of the walled town and the countryside. Was just a mile walk into the Lucignano town center. Pool was beautiful (but had to stay on your own side in your own chairs). Villa was mostly clean but was not very well stocked. Had several cooking supplies, but no soaps, coffee, etc. had to ask for hand washing dish soap as well as the fans that were mentioned to be included. Lilly was prompt to respond to requests although not very warm. Would have liked to hear about the history of the villa/area but she was busy with her own agenda. Would not have taken much for this to be an exceptional experience.